In a large pot, heat the olive oil, and add the rabbit until slightly brown. Add the onions, carrots, potatoes and the tomatoes, and pour half of the marinade on the ingredients. Add the remaining wine, peas, bay leaves, kidney and liver and simmer on low heat for about 2 hours, stir occasionally and add some more wine if the sauce begins to dry up. 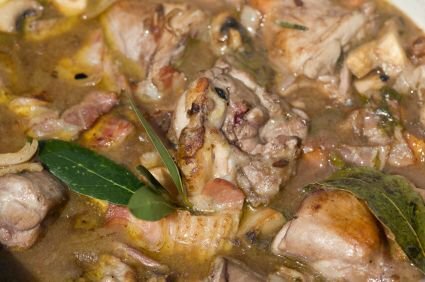 Cooking variations - you can choose to make the rabbit stew to look more brown by reducing the amount of tomatoes and kunserva use, I personally prefer the rabbit stew to have very little tomato past even if it is served with spaghetti. Boil some spaghetti (leave al dente) Cover with some sauce from the rabbit stew, do not add any rabbit pieces if you are serving rabbit stew as a main course, but you can add some of the rabbit liver to the sauce serving Finely grated Parmesan cheese can be added on top. This entry was posted in Maltese, Other Meat, Recipes, Second Course, Stews, Sunday Lunch and tagged fenek, food, Recipes, Stew, traditional maltese recipes. Bookmark the permalink.